A relatively inexpensive way to drive more prospects to your inflatable web site is through search engine marketing. Search engines offer a “pay-per-click” marketing model. When searchers type in their search term, sponsored ad links will appear at the top and/or side column of the results page. These ads are paid for by the advertiser, based on how many viewers click on the ad. One of the biggest benefits of this type of marketing is that you are able to display your inflatable ads to a highly targeted audience. Not only do you select the keywords where your ads will appear, you can also narrow this down to a targeted geographic location, by region of the country, state, or even cities and towns. Search engine advertising is also a great addition to your inflatable marketing because you only pay for visitors to your web site, hence “pay-per-click” campaigns. Many other forms of online advertising will charge you a flat rate or a price based on ad views. As you set up your search engine advertising campaign you will need to select keywords for which you want your ad to appear. Pricing per click is based on how competitive these keywords are, and how many other advertisers are also bidding on them. The bidding process will require you to enter a top price that you will pay for each click. This can be anywhere from ten cents to several dollars. The price that you pay will correlate with where your ad appears in the sponsored ads. Obviously the top is the best position, but not always the most cost effective one. To keep the price per click down a little you will need to be a little more creative with your keywords. Consider what your future customers will be searching for. For example the keyword “inflatable” is very broad, with many bidders. Instead try incorporating your geographic location, “Boston inflatable rentals” into the keywords. This will make your ad more targeted, allow you a lower bidding price, and be more likely to target people that are interested in your services. You can also set a monthly budget for your entire ad campaign, which will allow you to keep your advertising expenses within your marketing budget. The next step in setting up your advertising campaign is to create the text for your ad. You will have the opportunity to enter a heading and two or three lines of text. Then you will select a URL that visitors clicking on the ad will be directed to. It may be helpful to improve your clicks by including the keywords they are searching for in the heading of the ad as well. This will grab the attention of the searcher and make them more likely to click through to your inflatable web site. One of the most important parts to running a successful inflatable business is to provide high-quality, clean equipment. Taking care of your equipment can keep it in tip-top shape. Of course, things can always happen. 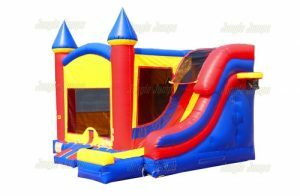 One of the most common problems that can arise with inflatable equipment is a rancid smell if the inflatable has been put away wet. And of course, a smelly inflatable is a huge turn-off for customers. If for some reason your inflatable is put away while it is still wet and a smell develops thoroughly cleaning the equipment and all vinyl areas can remove the smell. All cleaners that you use on your inflatable equipment should always be free of bleach of chlorine. These chemicals can weaken the threads of the inflatable. Cleaners specifically intended for soft or pliable vinyl are the only products that should be used on inflatables equipment. Matt-Kleen is a great product for cleaning vinyl products. Matt-Kleen is sold in concentration by the gallon. At the same time you should also remove any germs or bacteria that may be on the inflatable by using a sanitizing spray. Another risk for creating smells and bacteria through moisture is the storage area where your equipment is kept. Inflatables should always be stored in a dry area. You should also take care when transporting your inflatable. Never drag a rolled inflatable through wet ground or puddles. Even after cleaning and sanitizing the inflatable mold and mildew may have created black stains on the vinyl. Unfortunately, these black stains may be infused into the plastic of the inflatable. While a through cleaning will stop the spreading, the stains my not be able to be removed. Depending on the location and amount of stains this may make your inflatable unusable for consumer events. without having to make the customer aware of the problem. Never putting away wet equipment will prevent any problems with mold, mildew and bacteria in your inflatable. A simple cleaning and wipe down before and after each event, and allowing the product to dry thoroughly before putting it away will extend the life of your products. A fresh smelling, clean inflatable will make your customers feel good about your company and your products, helping in the success of your business. Word spreads quickly among customers regarding what inflatable company offers the highest quality products. Maintaining your inflatable products will extend their lives, and keep them smelling and looking fresh for years to come.